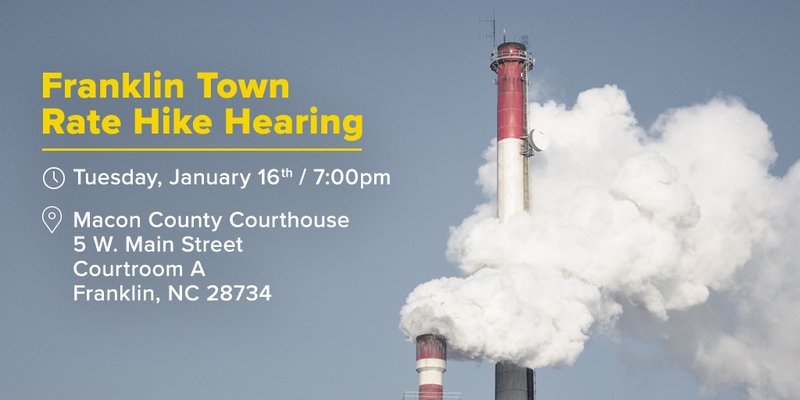 Macon County– On Tuesday, January 16, residents of Western North Carolina will have the opportunity to gather at the Macon County Courthouse in Franklin to voice their opinions about Duke Energy’s proposed rate hike. Duke Energy Carolinas, which serves 2.2 million customers across the state and much of Western North Carolina, has requested approval to raise residential energy rates by 16.7% and to increase their revenue by approximately $647 million. The rate hike is being requested soon after the company rose energy rates by 5% in 2013. Public interest advocates call the request an attempt to pass Duke’s coal ash clean up costs to the public, which they say would discourage energy-saving measures and be especially harmful for low-income families. The North Carolina Utilities Commission, the body that decides whether or not to approve Duke’s request, will receive the public testimony. The rate hike would increase a typical residential customer’s bill by $18.72 per month, and would raise energy bills for residential customers more than for industrial and commercial customers. The rate hike would also include a 66% increase of the base energy charge from $11.80 to $17.79, discouraging energy saving measures by customers. Public interest advocates believe this rate hike would leave residents of North Carolina’s far western counties, many of whom already face a harsh economic reality, with another unneeded financial burden. Counties including Jackson, Macon, Swain, Graham, Cherokee, and Clay have been named Tier 1 counties by the North Carolina Department of Commerce for 2018, meaning they face the highest level of economic distress in the state. According to the NC Department of Commerce’s 2018 County Tier Designations, Graham County has a median household income of less than $34,000, with 22% of families living below the poverty line. Swain County has a median family income of $36,103 and a 24.5% poverty rate, while Yancey County has a median household income of $36,418 with a 21.7% poverty rate. Over half of Duke’s rate hike – a total of $336 million – would be used to pay for the company’s coal ash cleanup costs. Before proposing the rate hike to the NC Utilities Commission, Duke sought to have these costs covered by its insurance provider, but was refused. Due to past actions, the insurance company stated that “Duke failed to take reasonable measures to avoid and/or mitigate the damage resulting from coal ash disposal.” In 2015, three Duke Energy companies including Duke Energy Carolinas plead guilty to nine criminal environmental violations for their failure to protect NC waterways from coal ash pollution. More recently, it was revealed that Duke was aware of the harms of coal ash beginning in the 1980’s, but did not begin to take precautions. The NC Utilities Commission hearing will be held Tuesday, January 16 at 7 pm at the Macon County Courthouse located at 5 W. Main St. Courtroom A, Franklin, NC, 28734. Those who plan to speak should arrive at 6:30 pm. MountainTrue is the oldest grassroots environmental non-profit in Western North Carolina. With offices in Hendersonville, Asheville, and Boone, we work in 23 counties to champion resilient forests, clean waters and healthy communities in our region. MountainTrue engages in policy advocacy at all levels of government, local project advocacy, and on-the-ground environmental restoration projects. Primary program areas include public lands, water quality, clean energy, land use/transportation, and citizen engagement. For more information: mountaintrue.org. The Macon County Chapter of the Western North Carolina Alliance is sponsoring a Franklin Green Drinks! Green Drinks is a time for local folks to get together and socialize, have a drink, talk about environmental or social justice issues, and just have a great time with one another. Our first Green Drinks was Tuesday, June 21. Over 20 people were in attendance! We had a presentation by Sunny Himes of the Greenway Invasives Project, updating us on the activities and projects of Franklin’s ever-popular Greenway along the Little Tennessee River; and it prompted great conversation! We hope you will join us for the next Franklin Green Drinks, happening the 3rd Tuesday of every month at the Rathskellar in Downtown Franklin.